Matt and I did a second float this month on the Gunpowder. It was his last day on the river for quite a while, since he moves to Montana next month. The weather was ideal, and the water temps in the fifty-nine to sixty degree range. Craneflies and caddis hatched steady all day, in addition to midges and the occasional sulphur. Over the course of the day we spotted trout rising in the riffles and flats, but never tried a dry fly. We crossed paths with another angler who was catching fish on dries, but we were having consistent success with streamers and nymphs. The trout were taking caddis pupa and cranefly patterns, while some big nymphs in sizes 10-12 caught fish under a Thingamabobber. In addition to wild browns between 7-12 inches we landed a dozen rainbows in the 12-15 inch range. We both encountered browns between 12-16 inches, including a couple we both had hooked, but lost them. I lost a memorable brown in the 16-17 inch range after a subtle take on a big rubber legged nymph caused me to lightly set the hook. 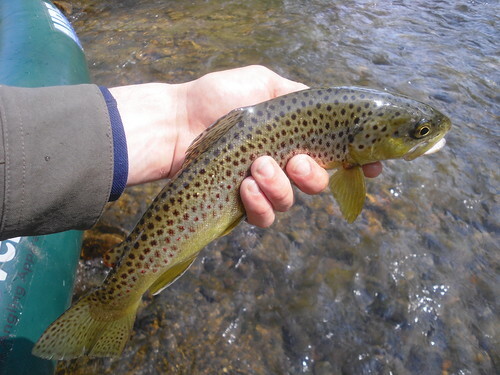 I was standing nearly on top of the fish, high sticking a riffle when I came tight to the brown. Immediately the brown jumped and landed under my rod tip, preventing me from taking slack out of the line. We both yelled out at the exact moment as the line went limp, and the fish was gone. By the end of the day we landed more fish than our previous float, somewhere in the range of thirty fish between us. The smaller browns were a lot of fun and really eager to eat, as were the rainbows which had gained some strength and color from time in the river. In the latest video I included some shots of gear, the boat and river. The rest of the footage includes Matt and I landing trout in numerous riffles and runs on the Gunpowder. This entry was posted in fishing report, video on April 27, 2010 by Jason du Pont. The unique conditions with high volumes of spillover on the Gunpowder means we are seeing many insects very early compared to previous years. Water temperatures are in the high fifties to low sixties, and held steady for the past three weeks with many mayflies hatching weeks ahead of schedule. The hendricksons are very early, showing up three weeks ago. The spinnerfall action after 7 pm means waiting out the bugs until dark. The quill gordons and march browns are still hatching, but their numbers are sparse compared to the hendricksons. On a few evenings this past week I fished until dark each night, and was rewarded with numerous spinners laying eggs and trout aggressively rising. For reference I had seen only a few duns hatch through the afternoon, and by 6:45 was ready to hit the trail, thinking the hatch wasn’t going to happen. I looked up against the sky and noticed waves of spinners slowly beginning to drop, which created a short lived but intense response from the trout. I’ve fished a few of these spinnerfalls, and the intensity can vary from one night to the next. I was surprised to see sulphurs hatching alongside hendricksons mid April, which is extremely early. Last year I saw the first sulphur on April 28th, and encountered the first fishable hatch on May 6th. This year I saw them on the 15th of April, and caught the first big emergence on a cloudy, rainy Wednesday this week. The browns wasted no time taking the sulphurs, a few even leaping up to take the duns, as they lifted off the water. I caught browns on a size 14 sulphur and saw duns emerging for about 2 hours, yet a weak hendrickson spinnerfall. The following day the conditions changed and the sulphur hatch was light, but the hendricksons returned to the water at dark. Caddis hatches are also a few weeks early, but the majority are hatching down river of the Catch & Release section. The variety of insects hatching through the course of the day means fishing a dry in the riffles is a great way to catch some trout on the Gunpowder. 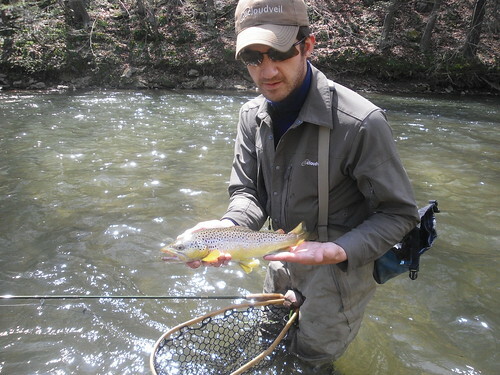 The brown below took a spinner pattern, while the brown above was caught by Matt on a second recent float trip. In the latest video I filmed a sulphur, quill gordon and egg laden hendrickson spinners returning to the water toward dark. I slowed the footage down and the dark bodied, size 14 spinners can be seen against the lighter sky. This entry was posted in fishing report, video on April 24, 2010 by Jason du Pont. Please join us for a flyfishing school. On Saturday, May 8, a Backwater Angler Guide will be teaching a fly fishing school that is ideal for beginners. If you’re planning on fly fishing in Maryland, or anywhere else for that matter, this course is a great introduction to the sport. The school covers knots, casting, gear, fly selection and an hour of on-stream instruction. Schools are held in a meadow overlooking the Gunpowder river by a Maryland state licensed and insured fishing guide. Class is held from 11:00 AM till 2:00 PM. Cost is $100 per person and includes the use of gear. A Maryland Non-tidal fishing license and trout stamp is required and may be purchased prior to the class with check or cash at the shop. Class size is limited to 4 and pre-payment is required. Please give us a call at 410-357-9557 or drop us a line at info@backwaterangler.com to register. This entry was posted in events on April 24, 2010 by Theaux Le Gardeur. The Gunpowder river is flowing at 115 Cfs, is 61 F and clear. Lots of good reports of Hendrickson spinner falls in the evening this week have pulled folks away from most TV outlets-hockey excluded. Only a mid-May Sulphur spinner fall may distract some SEC employees from what they’ve been watching. 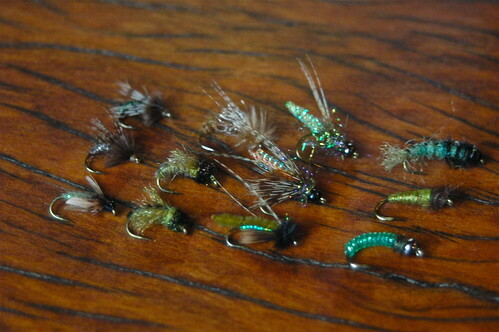 We’re also seeing Bwo’s and small caddis in the morning followed by a few Sulphurs. Swinging soft hackles and unweighted pheasant tails sized #14-16 has been very productive in the afternoon. We have more shade along the river now that the trees have leafed out and the dry fly fishing is picking up. A lot of folks fishing 7x this week have left flies in fish-especially in the riffles. Snowshoe emergers, and rusty spinners are worth a shot-especially late. This entry was posted in fishing report on April 23, 2010 by Theaux Le Gardeur. Fly Fishing Maryland? Please join us for an intermediate Fly Tying Class on Sunday, Saturday May 1, 2010 from 9:00 AM till 12:00 PM. The class focuses on Gunpowder river Sulphur patterns. Our very own Gunpowder river guides will be teaching this fun-filled intermediate class. Cost of the class is $45 per person, and includes the use of materials. Please bring your own tools.The class is limited to six and pre-payment is required. Please give us a call at 410-329-6821 or drop us a line at info@backwaterangler.com to register. This entry was posted in events on April 21, 2010 by Theaux Le Gardeur. Please join us for a flyfishing school. On Sunday, April 25, a Backwater Angler Guide will be teaching a fly fishing school that is ideal for beginners. If you’re planning on fly fishing in Maryland, or anywhere else for that matter, this course is a great introduction to the sport. The school covers knots, casting, gear, fly selection and an hour of on-stream instruction. Schools are held in a meadow overlooking the Gunpowder river by a Maryland state licensed and insured fishing guide. Class is held from 11:00 AM till 2:00 PM. Cost is $100 per person and includes the use of gear. 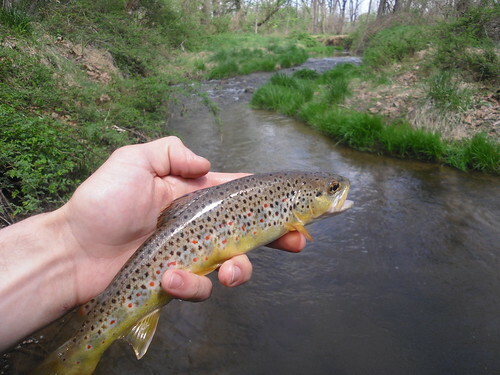 A Maryland Non-tidal fishing license and trout stamp is required and may be purchased prior to the class with check or cash at the shop. Class size is limited to 4 and pre-payment is required. Please give us a call at 410-357-9557 or drop us a line at info@backwaterangler.com to register. 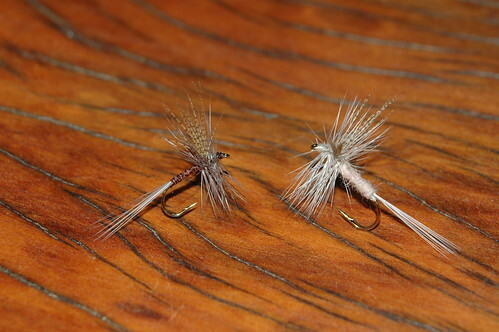 The shop has a wide selection of both caddis and mayfly nymph patterns to help fool those wary, wild brown trout. Large shipments of new patterns hand picked for our local hatches arrived in the shop the past week. I used many of these patterns successfully last season on the more heavily fished sections of the Gunpowder. 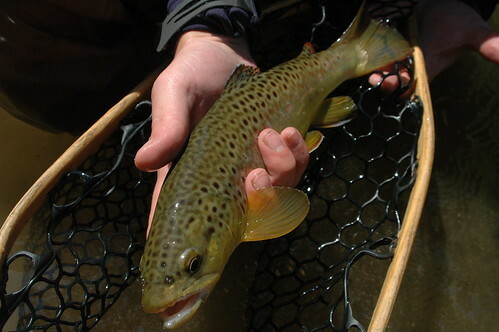 Trout never grow tired of pheasant tails, hares ears, and other common nymphs, but these new patterns tend to trick those larger browns. In Maryland the rivers provide caddis hatches through the Spring, Summer and Fall, long after the bigger mayflies have hatched. It’s surprising how many anglers have so few subsurface caddis patterns in their boxes. The picture above features Horodysky’s Nitro Caddis, Lawson’s Electric Caddis, Barrs Uncased Caddis, Fox’s Caddis Poopah, Mercer’s Z-Wing Caddis and Nori’s Caddis Pupa. Many of these patterns are available in numerous sizes and colors, and are great to swing or dead drift through the riffles. The dry fly anglers looking for more of a traditional mayfly pattern should check out some of Mike’s latest hendrickson patterns to arrive at the shop. This shipment of flies features both male and female patterns tied Catskill style, perfect for pocket water and choppy riffles. These patterns are great for skating in riffles in late afternoon. This entry was posted in gear, news, reviews on April 20, 2010 by Jason du Pont. The mayfly nymphs living under the rocks in the Gunpowder river are beginning to hatch in good numbers. Many anglers are experiencing good dry fly fishing during the hendrickson emergence and spinnerfall. The trout are really eating nymph patterns under the surface, especially at the end of the swing. The real mayflies are drifting down river to hatch in mass it seems, as the fish can be seen flashing and chasing bugs up to the surface. Just turn over a few rocks in a swift riffle area and you will quickly see the river is full of life. While fishing in the evening I spotted numerous March Brown spinners, Quill Gordons, Sulphurs and Hendrickson Spinners toward dark. Before the light got too low, I started turning over a few rocks and found nearly two dozen nymphs on one rock alone. I began filming them on the rock and then put a number of them in a Solo cup we use at the counter for flies. It is easy to see why wet flies and even hackle-less nymph patterns are working on the swing, once you watch these nymphs move in the water. The latest video features a few minutes of close up footage of the main staple of the trout’s diet for the coming weeks. The shop has a variety of nymph patterns in the correct sizes and colors to match these nymphs. This entry was posted in fishing report, video on April 20, 2010 by Jason du Pont. 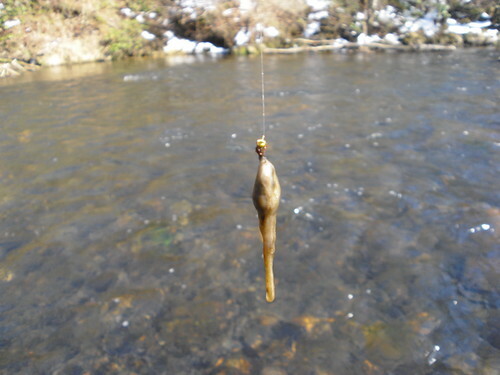 Over the past three years there is no denying that the “rock snot” has changed the aesthetics along the river and effective techniques during Winter months. Since this invasive was transferred to the Gunpowder its life cycle has become easier to follow. In the Winter the air and water temps hit the magic number and a tan peach fuzz begins to cover the rocks. In the following months from Jan-March the growths begin to cover wide expanses of the river bottom, and form long tendrils of grayish white snot. Those anglers who fished through this time frame the past few years know that at times the algae goes beyond frustrating, fouling the nymphs frequently. Fortunately just as quickly as it appeared in the Winter, the warmer water and higher flows of Spring start to flush the algae from the river bottom in April. Tippet knots, loop to loop connectors, and split shot also pick up small pieces of the cotton-like algae floating downriver. While frustrating, this break up process is a good thing. The algae looses its grip on the rocks and primarily is seen stuck on branches and logjams. Aside from slow water behind logjams, the algae seems to be a distant memory once the months of May and June arrive. There is still very little we know about Didymo in the Gunpowder and its effect on our hatches and trout, yet other waters may be affected differently. One thing we do know is we want to keep it out of as many of our Maryland rivers, and streams as possible. In just two years after Didymo was found in the Gunpowder, it was discovered in the Savage River this Winter. It was alarming that a river over three hours away was infected so quickly when you consider the number of other C & R, Delayed Harvest, and small wild trout streams found across the state. For years many anglers enjoyed fishing multiple rivers over a weekend, especially in Western Maryland, New York and Pennsylvania. Just a few years ago it wasn’t uncommon to hear reports of anglers fishing one stream in the morning and another in the evening using the same gear. Now this practice is considered extremely high risk for transferring any number of invasive species, like Whirling Disease, Mud Snails, Didymo, etc. Fly fishermen on the Gunpowder are using the salt stations, or bleaching gear at home, but the critical part is DRYING. I’ve spoken to a few anglers at the parking lots on the Gunpowder over the years, who were bound for waters in Pennsylvania, Delaware or Virginia that same evening oblivious to what effect they may have on those watersheds. The Savage is also in an epicenter of great fishing, with numerous rivers and brook trout streams less than an hour away in multiple states. I’ve heard more horror stories than I care too really, because many are under the impression that “treating” gear with salt or bleach will prevent the spread of invasive species. The treating and cleaning gear isn’t the hard part, but the extended drying time for felt (5 days minimum) is too long a wait for many to abstain from fishing other waters. I wanted to post the information provided by MDDNR below as a reminder, because some are misinterpreting or unaware of the proper steps to avoid transferring Didymo. Once this invasive algae enters your home waters, as it has the Savage and the Gunpowder, becoming an advocate for preventing its spread comes naturally from dealing with this nuisance each Winter and Spring. Protect YOUR rivers and streams! This entry was posted in news on April 18, 2010 by Jason du Pont. The month of April is prime time for dry fly anglers since the fish begin to respond to hatching mayflies and larger fly patterns. The midge fishing on the Gunpowder has been good early and late in the day, but reports of trout caught on hendrickson patterns increased this weekend. Some anglers witnessed emerging hendricksons midday and fish taking naturals and dries, while other anglers fished the dries blind in riffles. Swinging wets and soft hackles has been really effective any time of day, but especially in the evenings. When I got a call from my buddy Matt that he would be in town, we hit the evening bite on Sunday. We both caught five fish in two hours swinging a soft hackle that produced lots of hits and some fiesty browns in the 7-10 inch range. I saw a half dozen hendricksons, although most rising fish in the slow water were eating midges. A few anglers on the same stretch of water mentioned they did catch fish on midges and hendrickson dries before dark. 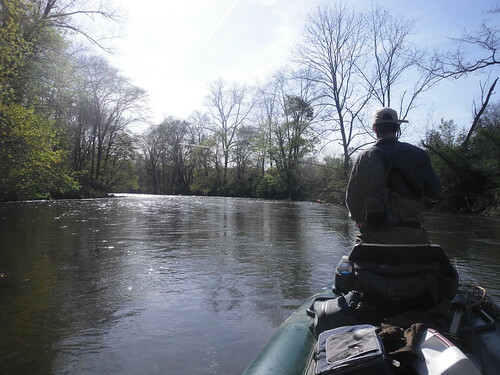 On the next day we decided to take advantage of the great flows and float the Gunpowder farther down river. Water temperature was great in this section at 58-59 degrees with a few caddis and lots of craneflies hatching throughout the day. I saw only a few mayflies from a distance, most likely quill gordons or female hendricksons. I rarely find rising trout in this section, but when a hatch is good the subsurface fishing can be phenomenal. Swinging wet flies through the riffles was a good back up plan, so I decided to make a pass with a streamer in the first run. A brown charged the streamer on the second swing, and struck the fly as it swung through a current toungue into the bouncing chop below. The trout took line downstream, bowed the rod over and finally surrendered at the net. It was healthy trout measuring just under fourteen inches. I decided to break from my normal routine and fish streamers all day without switching to nymphs. Two hours later my three biggest browns measured between 13-15 inches, all thick fish like the brown pictured below. Matt was finding plenty of action in the good spots on small nymph and emerger patterns under an indicator. 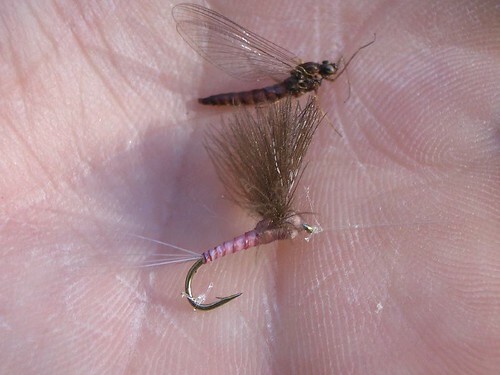 The amount of craneflies on the water by mid afternoon meant they were surely a staple of the trout under the surface. Small rubber legged nymphs also caught fish, as they have in the upper sections of river the past month. We fished hard through an eight hour day, targeting the same areas with our different techniques. Each particular trout was looking for a meal stripped as fast as possible, or small nymphs drifted through riffles and deep water. We even picked up a few trout while in motion using both set ups, including a few browns and rainbows in the 9-11 inch range. One of Matt’s favorite spots where he encountered larger trout in the past, gave up this healthy fourteen inch plus brown below. The weather was great, the flows perfect and we encountered 2 other anglers over miles of river. The latest video features some of our fish, river shots and a good cranefly hatch. This entry was posted in fishing report, video on April 14, 2010 by Jason du Pont.